With all eyes turned toward Destiny 2's Forsaken expansion this September, it's important to remember the current weekly traditions still going in the game. One of those traditions is the arrival of Xur, Agent of the Nine, each weekend. For the weekend of June 15, Xur has brought one of the best weapons for PvE activities in the entire game. Xur is in his normal spot in the EDZ on Earth, the site of this week's Flashpoint, on top of a cliff in the Winding Cove section. He's standing next to a crashed Fallen skiff. This week's weapon is Tractor Cannon, a monster of an Exotic shotgun. This weapon's powerful perk is Repulsor Force, which is the main feature of the gun. Tractor Cannon shoots out a powerful impulse that pushes enemies away, suppresses their abilities, and makes them more vulnerable to Void damage. Combining Tractor Cannon with other Void weapons and abilities makes it a must for melting enemies in PvE. It costs 29 Legendary Shards. This week's Titan armor is Actium War Rig, an excellent chest piece. This armor steadily reloads a portion of your equipped auto rifle's magazine from its reserves, effectively making each AR's magazine much bigger. It costs 23 Legendary Shards. 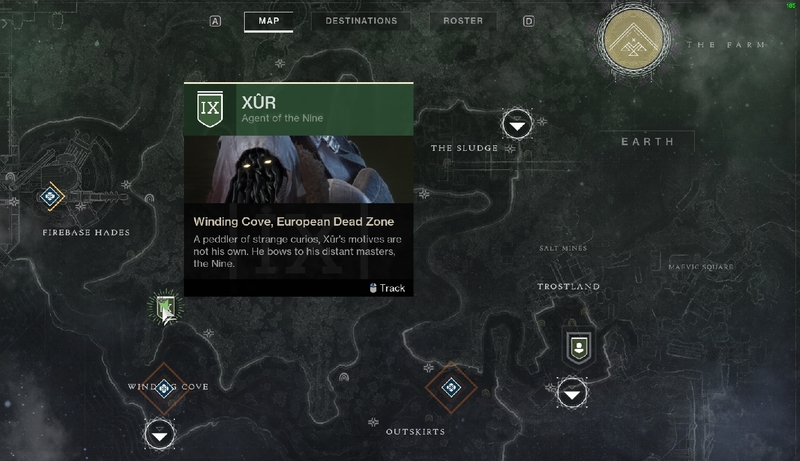 For Warlocks, Xur has brought The Stag. This helmet grants Rift energy when you're critically wounded, and upon death, it creates a brief healing rift on your corpse for your allies to use. It costs 23 Legendary Shards. 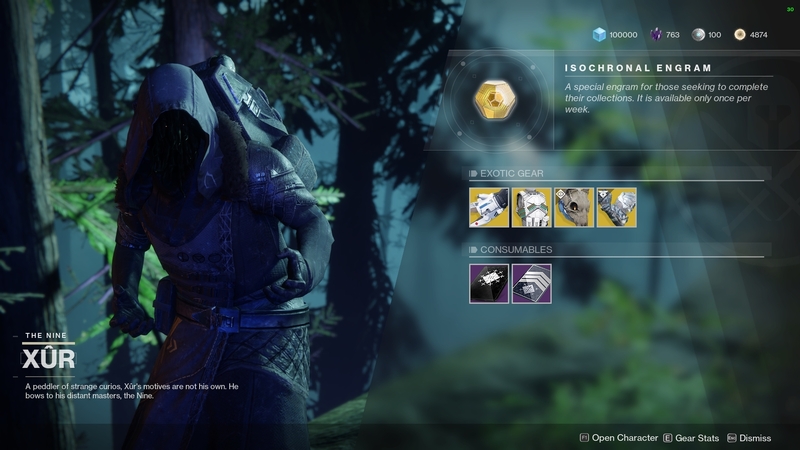 Xur's Hunter armor this week is a new one from the Warmind expansion, Sealed Ahamkara Grasps. These gauntlets reload your equipped weapon when you deal melee damage. They cost 23 Legendary Shards. Make sure to pick up Tractor Cannon. It's a must-have in the current PvE meta, and will most likely continue to be useful and fun to use by the time Forsaken comes out.